Early pest detection and management are essential to ensuring continued viability of the U.S. citrus industry. Rapid communication of new pests, significant outbreaks, and accurate host information depend on proper taxonomic identification of both pest and host. Many citrus pests and diseases are restricted to specific citrus taxa, so knowing the identity of the host may simplify pest identification. Identification of the plants being sampled is also important for accurate documentation of pests and diseases. 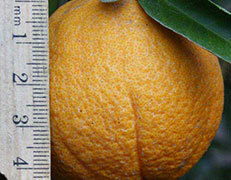 There are numerous non-citrus plants that have been identified as hosts to citrus pests and diseases. A complete listing and key to these hosts has not been available. To help fill these needs, Citrus ID provides PPQ, cooperators, and the citrus industry a comprehensive, user-friendly tool to support identification of host material. The nature of morphological variation in citrus makes a conventional dichotomous identification key to any but the wild species impossible to construct (Mabberley 1997), so we developed a heavily illustrated diagnostic tool centered around a multi-access key. Still, field identification to the level of cultivar remains impossible in most cases. This is partially due to the complicated reticulate breeding history of citrus, but also, selection has generally focused on characters such as taste, disease and stress resistance, and fruiting phenology rather than on characters of ornamental (and thus morphological) value. This tool facilitates identification to at least the cultivar group level within citrus (e.g., sweet oranges, sour oranges, etc. ), if not beyond for select cultivars.